The baby shower pins in rice game is a lovely plate of fun. You might be thinking that removing pins from rice seems easy enough but you will be surprised to find out how hard it actually is. After all the trick to it is that you won't see the pins you can only feel for them. That's right players will be blindfolded. But you don't have to take my word for it try it and see. You are in for a treat. Take your bowl of rice and mix in the safety pins. You want to make sure all pins are closed of course to avoid sticking anyone. Blindfold the first player and then explain the rules of the game. 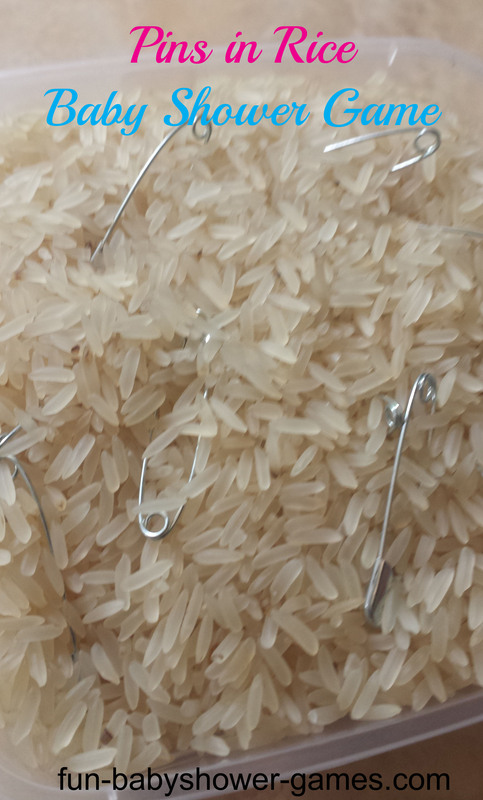 Each person has 1 minute to remove as many safety pins from the rice with their hands. When time runs out record the number of safety pins that were removed by that player and then pour them back into the rice. Repeat until all players have a turn. The person that got the most safety pins out of the rice at the end of the game is the winner. Give the winner a nice game prize just make sure its not a pack of rice.